Hot this week: Political Palmyra and love for Libya. Photo by Robert Clark for National Geographic. A new biography of the now-infamous art dealer, Hildebrand Gurlitt; Review by archaeologist Jens Notroff (Berlin). Our totally free online course starts again on 6 June! If you missed it the first time or want to go through it again, sign up. Remember that even if you can’t do the course that week, you will have access to the course materials for months and can go at your own pace. If you read anything about antiquities trafficking this month, read this. Although a well caught fire nearby, the Sohag archaeological gallery in Upper Egypt is fine contrary to reports. I am not sure that the premise of this article is useful. Risk is different in every context. The museum has a collection of over 10,000 human remains, including these four skulls. They want more states to ratify the underwater heritage convention. The site of El Peñón was looted before it was excavated by archaeologists. Most of the looting appears to be stone taking for construction. In the last 10 years, 281k looted Mexican antiquities have been seized. Various sacred items were taken including crowns and the clothing off a statue of the Christ child. The duo who stole the Chihuly pieces were apparently drunk and are now sorry. Artist Alfredo Barseguila’s piece has been vandalized. The Kankakee County Museum has been forced to rethink their security. Artist Sheila Dyer has her stolen mask back, along with a note. Spain has approved a medical exemption for José Carlos Bergantiños Díaz who is allegedly part of the forgery scheme. The cannon was stolen from a California veterans hall. Now that Kennewick Man has been declared Native America, who exactly can request his return? A feature on attorney Don Burris. Attorney responds to “the motion to dismiss my clients’ claims over the 1935 forced sale of the Guelph Treasure”. What ever criticism may exist about the effectiveness of this law, it is at least a symbolic gesture against the illicit trade. One of the criticisms of the law’s potential effectiveness. Two Sicilians were arrested with archaeological items; apparently they smuggled artefacts into Germany. In only 2 months, 30 church thefts have occurred in the province. Sekhemka has been lost; public to private hands. Three people took the painting from The Gallery Bar on Castle Cary High Street. A historic conviction, first of its kind where this particular piece of UK legislation was used. A Leonardo or a forgery by Shaun Grennhalgh? The piece is said to have belonged to Prince Svyatoslav; it was found in 1982, disappeared, and has now been returned with no details released. 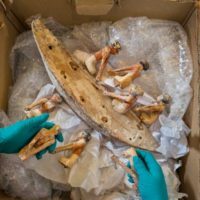 The pieces were found within two km of the Moldova border and were taken from the Castelvecchio museum last year. An Estonian customs official found the sword at the Estonia/Russia border in a car being driven by a Belerusian. Part of the large group return; this one from the Falconer Museum. The heads will be welcomes to the Te Papa marae on 27 May. But what exactly is a “satisfactory solution”? This is following unauthorised sale and thefts of Le Corbusier items. Following the arrest several items of sacred art were recovered. The crazy Nagpur University missing coin case trudges on. The pieces were smuggled into the US in 2002. An interesting call. Seen anything Iranian of interest lately? One could argue that everyone is using Palmyra for theatre at this point. National Geographic scans indicate there is nothing behind the wall. Are Egyptian Officials withholding this evidence? The statue of Dom Sebastiao was in Lisbon’s Rossio train station. The man “stepped off a 12ft sheer drop at Carisbrooke Castle, on the Isle of Wight” and there was no sign that warned of the danger. Gilbert, the painted zebra, has been stolen from a wildlife charity. It went missing from a show at the Museum of Contemporary Art, Santa Barbara.